We often hear, “People don’t like change.” This is not true. What people don’t like is change which is forced on them, especially where the perceived pain outweighs the perceived gain. When this kind of change is forced on people, they resist. When people co-create change, they are more likely to be invested in a successful result. Lean Change is an evolutionary approach to change proposed by Jason Little. 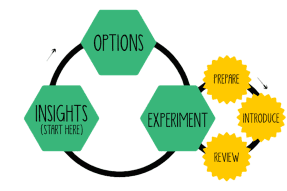 He suggests a 3-step feedback loop: Generate Insights; Create and Explore Options; and Run Experiments. Rinse and repeat. People are at the heart of this. It’s a collaborative process. This got me to thinking about Innovation Games® — the Collaboration Frameworks created by Luke Hohmann of Conteneo Inc. How could you enrich the Lean Change toolset using Innovation Games? Let’s break down Jason’s 3 steps to see where Luke’s frameworks might fit. Create a series of posters with hours of the day, days of the week, weeks of the year, months of the year and quarters. Get Participants to go around the posters documenting activities that take place to develop a shared understanding of what is going on in an organisation. Much as the name suggests, Me and My Shadow involves literally shadowing members of an organisation and documenting what they do. Ask open, powerful questions to drive your understanding. With My Worst Nightmare, you provide a safe space for people to express their fears in an engaging and fun way. You will need a flip chart, a trip to the stationery cupboard and groups of participants. Ask them to draw their worst nightmare about the organisation. Let them know that the wilder it is the better and that at the end they will be presenting their poster back to the rest of the room. They will create a short narrative of what is bothering them most about what’s going on in a safe way. Provide participants with a Cereal sized box and raid your stationery cupboard. Set the stage that the change that they desire is inside the box. They can’t touch it or feel it, but the box is covered in enticing messages about the change. What are the appealing aspects of the change? How is it different to other changes? Why is it better? Let them know they will be pitching their change back to the group. Give them some time to go wild with this (it never fails!) and get them pitching. Be sure that they know to present their ideas back in a “It looks like this so we can that” way. It’s the “so thats” that are important here. Document the “so that’s”, because that’s where the gold dust is. This technique is more advanced and takes greater facilitation skills. When done right, it’s very powerful. You will need some observers for this so that you can be totally present as a facilitator. You will also need some ideas of options you have and mix in some more which are totally outlandish and bizarre (hence “Give Them a Hot Tub”). I find the more “out there” the better. Prep the observers, gather the participants together and introduce the ideas one at a time. Use your skills as a facilitator to promote a discussion among the participants rathen than between you and them. When the conversation dries up on an idea, it’s time to move on to the next. Every so often, one of the “out there” ideas will come up which usually prompts giggling and an initial look of total confusion. Ride it, because this is where the magic is happening. That confused look and nervous giggling is the physical manifestation of Cognitive Dissonance. The participants’ brain will try its hardest to make the idea work. You’ll hear things like, “Oh wait! That could be…” This is what happens when new ideas are generated by smashing other ideas together in a wild and fun way. Once you have some options, you can learn what everyone thinks is most important in the gain vs pain stakes. The values in Buy a Feature are usually done via T-Shirt sizing with the team that needs to deliver a product. It can be used in Lean Change by creating T-Shirt sizing based on financial cost, opportunity cost and straight up pain of doing it. Even when I run Buy a Feature in person, I use the Conteneo Decision Engine to create the values and tell me how much I need to give participants. It makes the whole process simple. Get the participants together, divide up the fake money (or run it online) and off they go collaborating on “buying” the options that work for them collectively. The group can learn from each other what success looks like. The group can see where things have been missed and figure it out in advance. The group mentally prepares for the road ahead. The unexpected will always happen, but advanced planning like this is great preparation for any sort of undertaking. The review part of the experiment is a good time to reflect on things. This technique gets used a lot for Agile Retrospectives and is perhaps best known for that, although that wasn’t its original purpose. Draw a poster of a Speedboat on the sea. Explain that the Speedboat is a metaphor for the change. Anchors are things which held the change back. Propellers are things that made the change work well. Above the waves, the participants place propellers and below the waves, they place anchors. You facilitate a conversation around the relative position of these items and what that could mean. What worked? What didn’t? Why not? Feed these data back into your insights and off you go again. 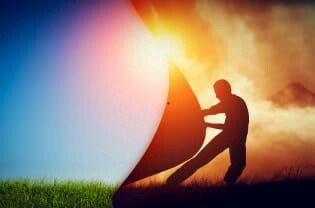 I hope this gives you some idea of the power of Collaboration Frameworks when combined with Lean Change Management to help your organisation change its way to success, one change at a time. If you’re interested in learning more about Lean Change and Innovation Games, I will be running the first course of its kind combining the 2 in London in March 2017. Join me. Father of twins, Agile Coach, CSP, LEGO® SERIOUS PLAY® Facilitator, Collaboration Instructor, continuous improver, I help organisations be the best they can be.